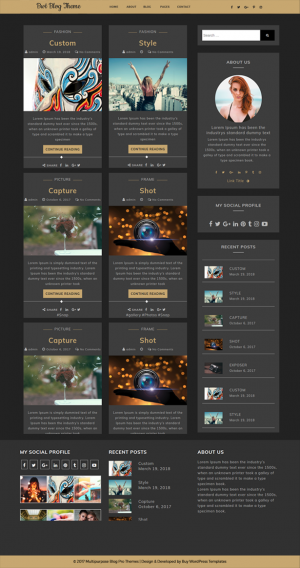 This free coaching WordPress template has fluid layout that adjusts on devices of varying screen sizes without breaking. It is all browsers compatible and comes with necessary files to translate the website into any language. Having your own logo is very common and your website should obviously feature it; this theme allows you to upload your own logo to make your online presence count. The theme also allows customizing the slider settings to make it more impressive. Having social media links and icons in website is very beneficial; it will give the much needed exposure to your website, make your content shareable on various networking platforms and your target audience can reach you and follow you on these platforms. As this free coaching WP template is SEO ready, your website is sure to get a higher rank in search engine results. Create an awesome website dedicated to teaching and learning profession without investing a penny with this free coaching WordPress template that will take care of all the online teaching process. It has clean and minimal design with professional look to make learning stress-free. Its front end interface is very easy to use and smooth navigation helps further. Its backend interface is also easily understandable and manageable so anyone with no coding knowledge can also use the theme. It has a well explained documentation to install, configure and make small changes to the theme on your own so you don’t have to hire any developer for small problems regarding website. As this free coaching WordPress theme is not overloaded with features, it is very light in weight and hence loads really fast. It is fully compatible with third party plugins, so now you can implement advanced features without involving in coding part.